It was a mixed weekend for Matiss Karro and Josh Gilbert of MVR-D Honda, after unfortunate incidents kept them from showing their full potential, and that of the CRF250R, at the fourth round of the British Motocross Championship at Hawkstone Park last weekend. 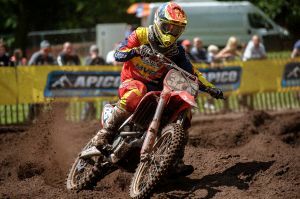 The deep sand and demanding hills of the Shropshire circuit proved to be a challenge for some MX2 riders but not for Karro during qualifying; the Latvian rider stayed strong throughout the session taking sixth place. Not one of his favourite tracks, Gilbert was unable to keep pace with the other riders finishing 29th. Natalie Kane was due to take part in the event but became unwell on the Saturday night and was unable to compete. Karro got out the gate well in the opening moto but was hit from behind in the first corner by another rider, leaving him to chase the field. After riding hard all race, Karro crossed the line 18th. Gilbert didn't get the start he needed and was also left playing catch-up, finishing in 21st. The second moto saw Karro start just outside of the top-ten after a bad start, but it wasn't long before he found his rhythm and fought through to finish eighth. Gilbert also had a battle on his hands after his start left him further down the field, but he crossed the line 19th and collected some hard-earned points. Matiss Karro - "I'm not happy with my weekend and these results do not sit well with me. I will work hard before the next round to improve this." "I felt good on the bike but my starts let me down. I'm going to practice my starts next week because I know I can do better in this area." Mark Chamberlain - team manager -"It wasn't a good weekend in general with Natalie getting sick, which meant she couldn't ride, and Matiss struggled. We had some setup issues this morning but that isn't an excuse, as we all know it should have been better. Josh was riding well; he just needs a better qualifying position and start."